Citation Information: J Clin Invest. 2017;127(4):1485-1490. https://doi.org/10.1172/JCI90667. Clinical presentation and location of mutations in PSENEN. (A–C) Familial case in a Thai male with reticulate hyperpigmentation in the (A) frontal aspect of the neck, (B) axilla, and (C) back. (D–I) Affected members of an Indian family. 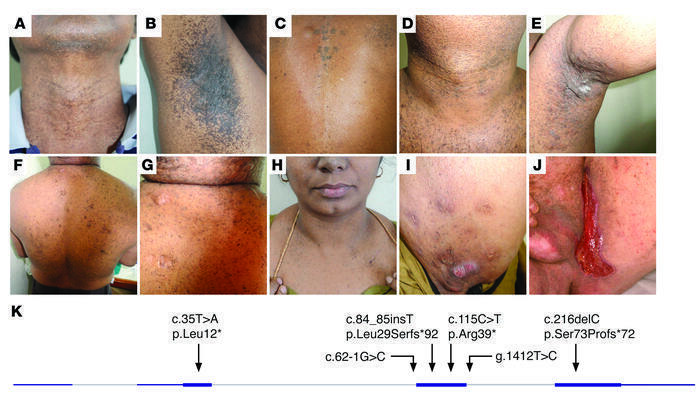 (D) Indian man with reticulate hyperpigmentation and hyperkeratotic brown papules on the neck, (E) axilla, and (F and G) trunk. (E) AI is present in the axillary region. This patient’s sister shows (H) hyperpigmentation of the intermammary cleft and (I) AI in the axilla. (J) German man with reticulate hyperpigmentation in the perianal region, which represents a postoperative lesion following surgical treatment for AI. (K) Depiction of the exon structure of PSENEN. Identified mutations are indicated by arrowheads. Mutations are defined at both the nucleotide and protein levels.